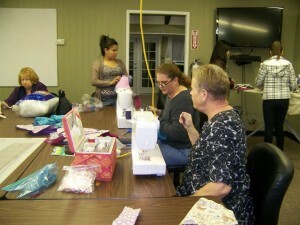 Members of the Zonta Club of Porterville hand-make heart shaped pillows with straps. The strap has elastic on one end so it adjusts under the armpit next to the breast that was operated on. There is a pocket on the outside so the cancer patient who has undergone surgery, can put a cold or hot pack in the pocket and tuck it under the armpit, like a purse, next to the incision site. Since 2012, 750 pillows have been distributed to men and women. Because pillows are distributed through a major Hospital Cancer Center, Zonta receives extensive exposure. The pillows have a label offering wishes from Zonta Club of Porterville, making patients’ family and friends aware of Zonta’s health advocacy. Sometimes the receipient of the pillow will travel and take the pillow along. So wherever they go and whoever they meet finds out about the pillow and through that about Zonta Club. In fact, our pillow has gone all the way to New Zealand! 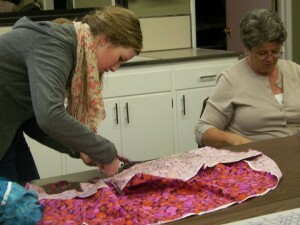 Fabric is requested from the public, which also increases awareness. Often times, Z-Club members come to help make the pillows and thus spread the word about the project among their friends and family. This project was awarded the Best Community Service Project Award for 2013 by the Porterville Chamber of Commerce. Winner of the Chamber of Commerce Service Project of the Year 2013! 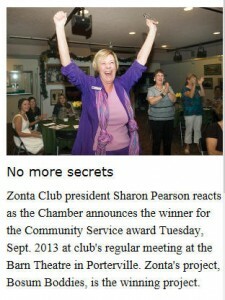 Zonta members do more than raise money to give to worthy causes. Bosom Buddies is a “hands on” project, making heart shaped pillows for post-surgery breast cancer patients. 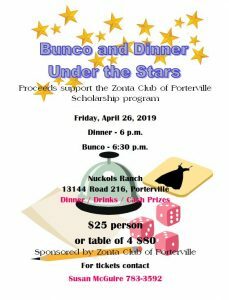 The Porterville community is even involved, donating fabric, stuffing and notions until we had enough for the next couple years. Over 750 pillows have been distributed and, unfortunately, the need for more never stops.